College can be stressful. Here are four ways to help make everything a lot more manageable and enjoyable. Every college student, no matter what major, age, race, or gender, has one uniting goal — and I’m not talking about having a bedroom to yourself, or free tuition, or randomly finding twenty dollars on the ground. It’s eliminating stress. Although we come to college with high hopes and many of us start off with a sense of gratitude for sheerly being accepted in the first place, when the tests start rolling on and the pressures begin to rise we quickly lose our freshman glow and begin to feel overwhelmed. We begin to wonder if we are doing enough… or doing too much. If you’ve been struggling with managing the stresses of college life, know that you are not alone. Just as importantly, know that you do not have to stay stressed. 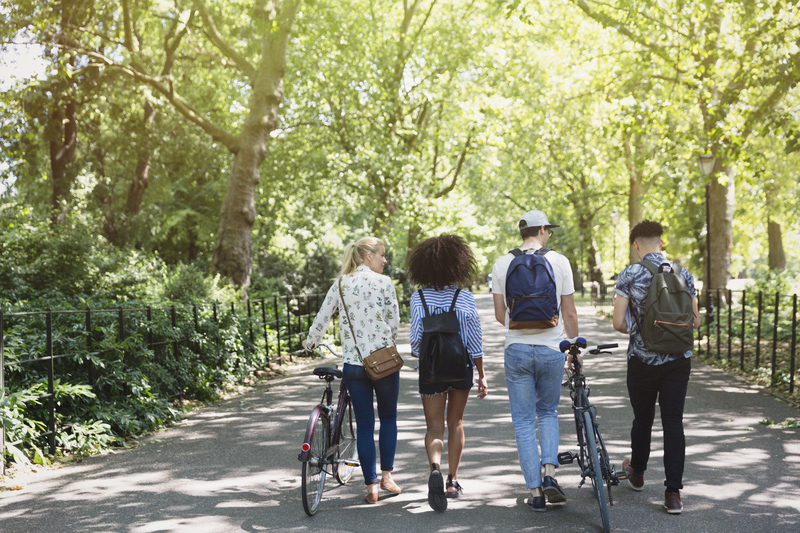 The stereotype of a stressed-out college student can stay a stereotype that you do not have to conform to; college should be a time to learn, explore, grow, transition, and find yourself. Note that list does not include pull all-nighters while your tears roll onto your math homework or lay in bed for hours contemplating whether or not you’re actually “college material.” So, in this article, my goal is to help you (and myself) learn and implement strategies in our lives to help us eliminate stressors and get the most of our college experience, and we’ll dive into the importance of sleep, breathing, exercise — and then not overthinking all those things in the first place. Sleep. According to the University Health Center at the University of Georgia, the average college student receives 6-6.9 hours of sleep each night. This is slightly under the recommended eight hours of sleep, and every time we get less sleep than what our body needs we create a sleep debt. This sleep debt continues to accumulate until our brain begins to demand sleep in order to compensate for the overwhelming indebtedness, causing us to become more drowsy, and sometimes, fall asleep in undesirable places. Not only might we miss out on a few important lectures or struggle to be fully attentive, but a lack of sleep can also decrease our immune system, has been correlated to a lower GPA, and not surprisingly, leads to stress. According to Stanford stress expert Robert Sapolsky, the same chemicals that induce deep sleep also help slow down our production of ACTH, which is the chemical that tells our adrenal gland to produce adrenaline and other hormones that are linked to stress. Therefore, by allowing our body to truly get a good nights sleep, we limit the number of stress hormones that the adrenal gland pumps out and we are able to rest and relax more fully. Ironically enough, the reason why many of us don’t get enough sleep is the same reason why we should desire it. Often times, we put sleep low on our priority list so that we are able to do more work, be more productive, and engage more socially. However, the less sleep we get, the less we are able to perform these actions to the best of our ability. If we want to be a better friend, get better grades, and do more, then we really need to start taking an honest assessment of our energy and sleep levels. Sometimes, that extra hour of sleep can lead to double the productivity and half the stress. Therefore, if you’ve been struggling with stress management lately, put sleep first. Shut off the screen, put away the homework, snuggle into some comfy pajamas, and get a good night’s rest — if you do so, you’ll start to see that things are a lot more manageable. Breathing. Many times we associate the root of our stress with external circumstances, and thus, we believe our stress will only be affected by changing what is going on the outside. For example, if we are stressed about homework, we believe we somehow need to adjust or complete our homework in order to rid of us the tension we are experiencing. However, although going straight for the external source may provide some benefits, this method is not always successful because somethings can not be changed immediately or they may just be entirely out of our control. Luckily, there is another solution, and this one involves a technique that is entirely in our control and proven to be effective: changing our breathing. For starters, to truly understand our body’s response to stress we must first understand what is causing the physical feeling of stress. Our body activates one of two main systems depending how threatening it perceives its current situation: the sympathetic and the parasympathetic nervous system. Our sympathetic system is what takes control when we feel stressed and sends us into “survival mode” in order to save us from any perceived threat, and our parasympathetic system is our body’s response at rest and is associated with relaxation. Therefore, if our goal is to eliminate stress, what we really seek to do is activate our parasympathetic system and deactivate our sympathetic one. Fortunately, research has shown that our breathing is the “underlying mechanism” that guides the responses from our sympathetic and parasympathetic nervous systems, thus giving us an easily accessible way to influence our biological processes. For instance, rapid, shallow breaths are associated with an increase of activity in the sympathetic nervous system and deep, slow breaths are effective with activating the parasympathetic nervous system. By utilizing our breath to call upon our parasympathetic nervous system, we will not only relax our body and leave our tense, stressed physical state but also be less susceptible to becoming reactive to stress in the future. In one study, participants who were engaged in deep breathing with a prolonged exhalation were less likely to be aroused by anxiety-provoking situations than those who had not underwent the breathing practice. Therefore, by engaging in slow, deep breathing patterns, we can eliminate the feeling of “being stressed” that so many of us detest and put ourselves in a state of relaxation that allows us to think, move, and live with more freedom. So, the next time you feel yourself getting physically worked up, take your eyes off the external factors and focus internally. Breathe. Breathe in, and breathe out more. Take your time. Do it as many times as you need to until you feel a difference, and then return to your task again, this time operating with your parasympathetic nervous system engaged rather than your sympathetic one. Odds are, things will seem a lot more doable and enjoyable. Exercise. People go to the gym for multiple reasons. Some go with the sheer purpose of losing weight, others go to gain muscle, and some go to figure out the magic formula to do both simultaneously. Others, however, find the gym not so much as a way to improve their physical health but rather their mental stability. Instead of losing weight, they seek ways to lose stress and anxiety, and instead of gaining muscle, they search for new ways to gain clarity and peace. In the process of this journey they will surely discover that their physical health has improved, but that was not the ultimate motivator, and we can take a similar approach to exercise to help us eliminate the building stressors in our life. Research has shown that regular aerobic exercises has significantly decreased sympathetic nervous system activity, which is often associated with anxiety, stress, and that oh-so-uncomfortable feeling of “fight-or-flight.” In addition, studies have indicated that cardiovascular training can increase our levels of serotonin, which is responsible for regulating our mood, social behavior, sleep, memory, desires, and more. Unfortunately, many people associate exercise with pain — which can not only heighten their anxiety if they do decide to go the gym, but can completely deter them from going altogether. However, this fear can be adjusted because it often times stem from the inner coach inside our head. Ask yourself these questions: When you exercise, are you judging yourself? Comparing yourself? Worried you aren’t working hard enough or doing it right? Are you disappointed or mad at yourself if you can’t hit the pace on the treadmill or lift the weights you want to? If you said yes to any of these questions, I would bet that sometimes going to the gym feels more like a threat than a safe, healthy experience. What if you went to see how much fun how you could have? How fit you could get? What if you were willing to tell yourself “good job” just for sheerly showing up? The experience of exercise does not need to be something for you to pin your self-worth on. Any day you go, whatever you do, you are improving. You are making yourself healthier, and it doesn’t matter if you can’t lift the bar or if you are still at walking speed on the treadmill. Just do you. Some days our easier than others, but by giving yourself unconditional support and treating it as a win no matter what — you’ll find that it isn’t as painful as you initially thought. And as a plus, you’ll feel a lot better, too. Not completely, but just for a second. The problem with newsletters, articles, and self-help books that proclaim they know the way to eliminating the stress from our lives is that they seem to offer a “quick-fix” solution to all our mental and emotional struggles. We search and search for a formula to make us happier, to make us feel better, to make us less stressed, and although there are definite useful tools in this world and that the quest for self-betterment is extremely admirable, it creates the false idea in our head that all we need to do is add A + B to get C. But, it’s not that simple. Sometimes we are going to be stressed. We don’t want to be. We know we shouldn’t be. But we are. And I do think we should look for ways to relieve ourselves of our stress, but before we do that, we need to give ourselves comfort for being stressed in a non-judgmental manner. Many times, when we really don’t want to be stressed and we become stressed, it ignites a whirlwind of judgment in our minds. Why are you stressed right now? Don’t you know how bad this is for your health? Why aren’t you exercising more? I wish you could just breathe right! However, this criticizing voice just pushes us deeper into our stress rather than giving us the motivation and desire to alleviate it. When we are stressed, we don’t need to look at it as initially “bad” or think we are doing something wrong. Instead, we can just view our current circumstance in a detached manner by saying “I am experiencing stress right now” rather than “I am stressed.” By eliminating our identity from the emotion, we can let go of the fear and criticism that comes along with something that is completely out of our control. Our initial reaction is subconscious. If we didn’t want to be stressed and we could control it, we would never be stressed. But, that’s just not how it works. What we can control are the steps we take when do we realize we are experiencing stress — and the best, most successful actions come from a place of love rather frustration. When you experience stress, give yourself the compassion and comfort you need in the moment. You know you don’t want to be, but you also know you didn’t choose this. Ask yourself what you need right now. Do you just need to rethink what is making you stressed and try to change your perspective? Do you need to take a break and maybe go on a walk? Do you need to call a loved one? Taking a break from your work doesn’t make you weak, it makes you strong for listening to yourself. So, whenever you feel stressed, know that it is okay. We all feel stressed every once in awhile. You’re human. I repeat: it is okay. Listen to what you truly need. You can read all the self-help articles, books, and newsletters you want, but at the end of the day, if you trying to run away from your natural, human, and uncomfortable emotions you’ll just be covering up your wounds with a Band-Aid rather than really understanding what’s causing your stress. And by acknowledging your stress and still loving yourself despite of it, you’ll be able to find relaxation. Originally published in the USC Performance Science Club Newsletter.